Hey, I hope you are all having a great week so far. 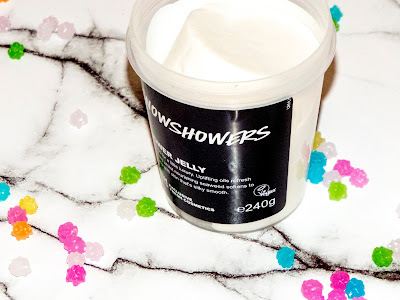 Today I'm going to be reviewing one of the products I got from the Lush Kitchen, Snowshowers Shower Jelly. I ordered this in December just after Christmas so I've got to use it a few times so I thought I would share my thoughts on it with you all today. I've only ever tried one other Lush shower jelly before this one, Santa's Belly, which I adore so I thought I would expand my collection and when I read the description for Snowshowers I knew I had to have it. "Lather up this Champagne-scented jelly-with elderflower infusion, zesty sweet orange and lime oils-to lavishly cleanse body and hair"
OK so the smell is incredible, really fresh but with a tiny alcoholic hint which is not in any way unpleasant. Though the name Snowshowers makes me think of winter I would say the scent is definitely more summery, it reminds me of drinking elderflower champagne at my brother's wedding in the summer of 2013. Even though I'm loving using it now I know it will be heavenly to use in the summer. So the jelly can be a bit hard to use at first and I have dropped this a fair few times but after a while you get the hang of it. I tried ripping a little part of to see if it was easier but it's much easier just to use the whole jelly. I was worried that doing this might make it disappear but I have used it several times now and it doesn't seem to have made a dent, this is definitely going to last me a fair while. Snowshowers lathers up really well and I have actually used it instead of shaving cream once and it didn't give me any shaving rash so that was a pleasant surprise. My skin feels so fresh and cleansed after I've used this shower jelly, although I haven't tried it on my hair yet I am very tempted. I can't think of any drawbacks to this shower jelly apart from it being a tiny bit awkward to use at first but I am so pleased I managed to get this from the kitchen and if it pops up in there again I will definitely have to stock up on it. I definitely recommend you try it out if you ever spot it on the website. 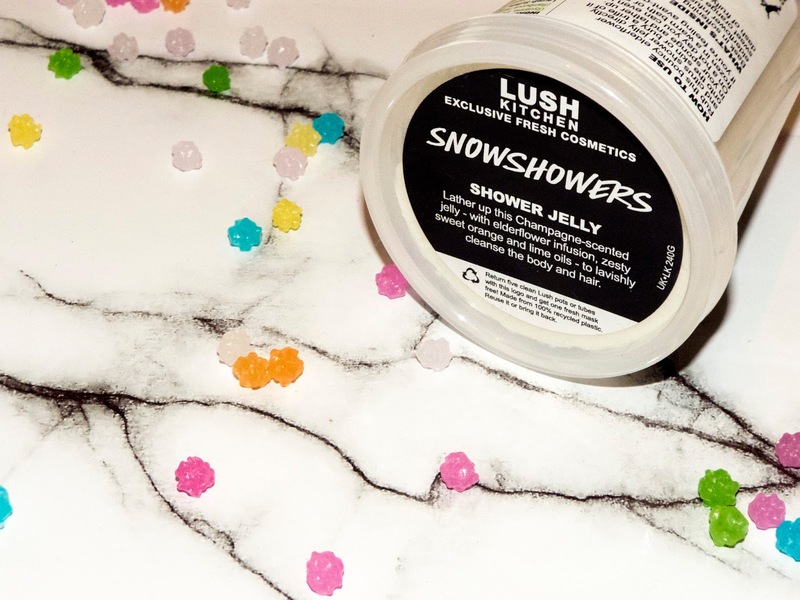 I hoped you enjoyed this review of Lush's Snowshowers Shower Jelly, have you ever tried it before? What are your opinions on shower jellies? I definitely recommend it, thanks for stopping by! oh i bet this smells divine! thanks for the share lovely. It really does, you're welcome lovely! Thanks for dropping by! I'll let you know if I try it on my hair. Thanks for popping in! I really enjoy using them I definitely recommend them. Thanks for stopping by lovely! I hope you do find it as it's gorgeous, oo I'll have to try Whoosh. Thanks for stopping by! I really recommend it. Thanks for popping in! Oh wow I bet it smelt amazing! Thank you for dropping by! I really recommend them they are so lovely. Thanks for stopping by!